Scene: There is no bread in the stores. The stores have been ransacked. You’re a prepper and have some long-term food storage… but can you make bread or biscuits? One of the easiest ways to supplement your food storage is to have the ingredients and supplies (and know-how) to make bread. The raw ingredient to mill your own flour. Stores well. Electric and/or Hand (manual-operated) grain mill for making flour. If the power grid is down, a hand-mill will obviously be necessary. The thing is, how many of you have a storage of wheat berries and how many of you have a hand grain mill? For those of you who do have these, how many of you have actually used them and made your own bread from scratch? Did you know that if you buy flour (wheat that has already been milled) that its shelf life is fairly short? I ask these questions to challenge your preps. If you’re serious about food storage, you should have (among the many other items) wheat (not flour – it doesn’t store very well) packed for long term in sealed mylar bags within 5-gallon buckets (as an example), AND you should have a hand grain mill. 50-lb bags of hard red wheat can be purchased from many sources (check our advertisers on the right of this page, some of whom do stock this). Generally speaking, wheat berries will be good for at least a year if left as-is. However the shelf life will be extended to at least a decade or decades if you seal them in mylar with oxygen absorbers and a bit of diatomaceous earth (food grade). For the most part, there are three hand grain mills which seem to be the most popular, each of them with their own price range. The Victorio Hand Grain Mill, originally named the ‘Back to Basics 555′, has fairly good reviews for it’s price range (~ $50). This might be a ‘good enough’ hand grain mill for the occasional user who isn’t too concerned that the flour may not grind as fine as more expensive mills or may not hold up as well under heavy usage. The Wonder Junior Deluxe Hand Grain / Flour Mill Hand Grain Mill, is priced mid-range, perhaps making it a good value for quality vs. price. This hand mill comes with stone heads and stainless steel burr heads to accommodate different conditions, and will apparently grind fine flour (and everything else) without issue. It’s pricey though (~ $200), but will no doubt hold up to more heavy use. 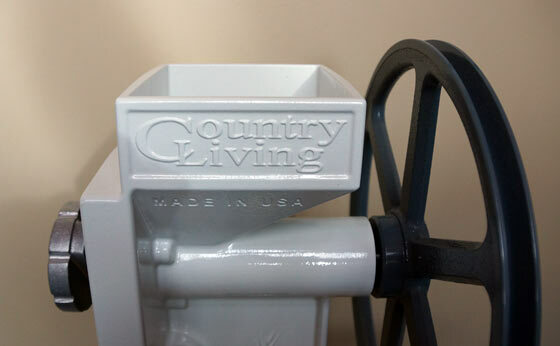 The Country Living Hand Grain Mill is considered top-of-the-line and will last generations. It is built with the highest quality. It is expensive though (~ $400), but is very rugged and sized to last a long time under heavy use. I have one of these and can attest to its build quality. So, examine your preps having to do with making bread from scratch (with no power). The simplest bread recipe for preppers in pita bread. It can be cooked on a grill. It is made of thin flat circles so it cooks fast. One of the hardest things to do without equipment is milling grain. What folks will likely do is skip eating bread and merely add hot water to what grains they can source in the wild or grow. Otherwise you can use more energy to mill the grain versus how many calories you get from eating the bread. Take into account the firewood needed, drawing the water, growing, or finding a grain, and you’ll soon see that bread was an incredible technological advance plus meant you were wealthy in a sense. The truly blessed had querns, but unless you’re a stone mason, you’re going to have trouble making one. There are ways of pounding grain with tools that are akin to oversized mortar and pestle, but in America the tool for grinding was often attached to a stout tree branch to help carry the weight (versus a person holding it) and using the sway of the branch to raise and lower it. That’s a lot of work. Otherwise you’re hand grinding by rolling a smooth rock into a depression holding the grain. Again, a lot of work, and one that was and is still utilzed for corn. Buy a hand mill and save yourself all of that trouble. Several preppers who have a knack for engineering have rigged up old exercise bicycles to use their legs to drive a belt and turn the mill. That’s more efficient. Bannock was a survival bread that was used by the Irish. They frequently cut the wheat flour in half and used half white clover blossom flour. If you do this, the taste is still fine and the wheat flour allows the yeast to rise. (Only wheat has the gluten to allow yeast fermentation to work). One could mill grass seed and do the same thing. Think, if you use found wild edibles and have less milling, then you provide as much nutrition and with less work. Little savings like that might mean the difference in survival. Of course, if you can make bannock, you’d have to have the milk from goats or cows to acquire the fat for butter, or have lard from some animal, so again, in a sense you’d be wealthy versus other survivors. The most common Civil War bread (for soldiers and their families on reduced rations) was hardtack. Your yeast and your baking powder will run out. It bakes up hard, but you dip in water or soup to make it less difficult to chew. I seem to recall a flatbread type product that could be ‘baked’ in open sunlight. You could live a long while on bread and soup. Might be nice to have part of your life be boring. Unless you live out in the sticks you should remember to practice odor control. Food smells travel quite far. and, good to include types of hand mills. also, thanks all for the recipes. Did you notice how each bread recipe had benefits? Pita bread is the fastest to cook, and this is important since that might be a factor. It’s the easiest to cook too most of the time. Bannock since it has fat provides the most calories, and one could easily add things in season like hickory nuts which are abundant in some areas. It was often rolled into a cylindrical shape then draped across a green wood branch to cook above a bed of coals. Hardtack lasts a long time, so one could make it up when you have the oportunity to bake, then eat it later for times when you don’t have the ability to do so. That saves you firewood. It preserves well. One could modify this with dried grasshopper protein which imparts a nutty flavor and then use this as a survival bread (the LDS folks called this survival fruitcake). Add a little ethanol, and raisins and nuts, and you have panforte, a medieval survival bread. Remember that any wild edibles that you catch can be disguised by putting into salads, stews, soups, and bread. Many people are nervous about eating them, but it’s better for the cook to be smart about inserting them into the meal in such a way that the overwhelming taste is normal but has these additions. The italians often dipped their bread into an olive oil that might have rosemary, oregano, basil, garlic in it, and since these have strong flavors they can help mask or improve the taste of breads. That boosts calories significantly, adds medicinal value, and helps the bread store better than perhaps putting fat within it too. Some models have the ability to add an electric motor to operate the grinder. No sense in living like it’s post SHTF before it’s time. A motor would make it a *lot* easier to practice and learn. Here is a simple bread it is like a tortilla,and is easy and quick . I use simple stuff cause in a dire situation you might not have all the fixings,so wanted to keep it as simple as I could in case you do not have all the things you need. If you run out of yeast, and don’t want to make sourdough, but you do have some raisins on hand, or grapes growing in your yard, then here’s a way to produce yeast. Raisins have long been made into raisin wine. In fact, many Peace Corps volunteers can’t buy ethanol because it wouldn’t look good or compromise their mission, so they make raisin wine. I’ll leave you to look up how to do that very simple process. The pioneers made something very similar with either grapes or persimmons. Anyway, take a handful of grapes and some pure water and place that in a small jar with a cap on it. Everyday, open it briefly and watch for bubbles forming. The fizzing will eventually make it de-gas as you open it. Then it’s produced enough yeast. The yeasts grow because of the high sugar content of the raisins. Just add them to the bread plus the water as both have enough yeast to make your flour rise. This method is used in Japan and Austria to make yeast breads. You can also catch ‘wild’ yeast by mixing flour and water together, put in an open jar covered with thin cloth, leave it out for a few days until it starts bubbling a lot and it’s ready to use. I have a jar of starter I made with this method several years ago. Just use some of your starter regularly, and feed it. It will last forever. Irish soda bread is easy to make very good bread. (recipes on line) Our church soup night has a great following for the soda bread. Soak your wheat berries over night. Spread them on a screen of some sort. Rinse them about twice a day for 2 days. This will get you sprouts of about 1/4 to 1/2 inch. Then soak them again for about 6 hours. Drain, then run them through a hand meat grinder. The meat grinders are much cheaper than a hand grain mill. Use this as you would flour. You will have to cut back some on the liquid in the recipe. The sprouts give you a sweeter bread also.